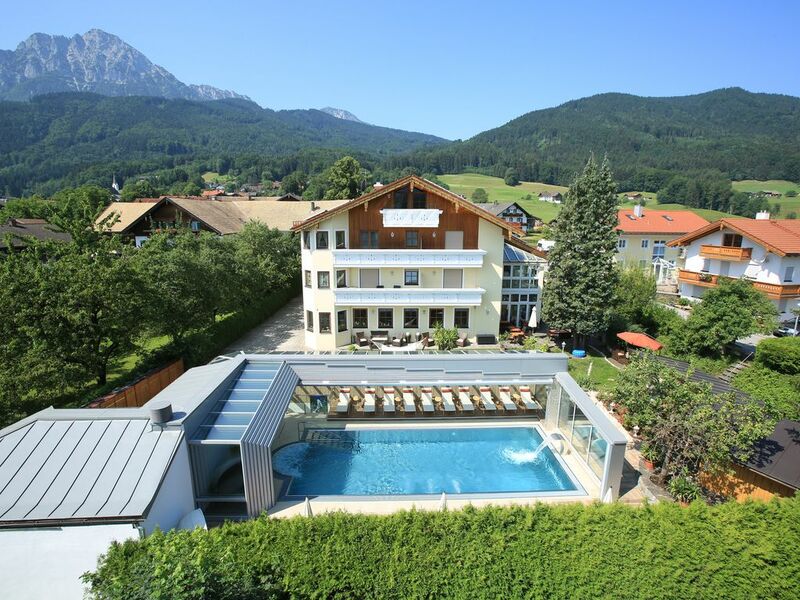 This exclusive vacation apartment is located in a in Cottage-Hotel in Berchtesgadener Land. There is a swimming pool and a sauna. We organize barbecue evenings, and a breakfast buffet and dinner are available if you wish. The apartment has a balcony and is quietly located on a play street. The fresh air health resort is the ideal starting point from which to get to know Berchtesgadener and the Salzburger Land, or to take a cure in Bad Reichenhall. You will love the spectacular landscape. Ski: The town is an ideal starting point for trips to the Saalbach, Flachau, Hochkönig, Lofer and Berchtesgaden ski resorts, all of which are a 20 to 30 minutes drive away. There is a floodlit ski lift 10 minutes away. Inexpensive ski classes, ski rentals, cross-country, sledding, curling and skating are all available. After a winter hike, you can finish off your day with a 'hunter's tea' (tea with rum) in a jolly atmosphere.